On May 1, 2011 GoMacro Vegan Macrobiotic snack bars will be available on WestJet flights across North America! Enjoy a healthy whole grain Tahini Date Gluten Free GoMacro bar on your next flight! 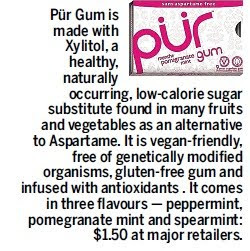 Posted by Planet Foods at 9:56 a.m.
Posted by bkent at 9:28 a.m. RUNNERS favorite Waffle? Honey Stinger of course! Honey Stinger Waffles are featured as a bring along with you boost while running in RUNNERS MAGAZINE this month.